Did you know that 75% of Valley homes and businesses are on a non-public (sewer) waste disposal system? This compares with the national average of 25%. A well designed and maintained septic system can be very cost effective (while monthly sewer bills can add up quickly). However, neglecting or abusing the septic system or failing to do regular septic tank pumping can have very expensive repercussions. Backups, damage to flooring, walls and furnishings, losing time from work or school, or worse yet, a system that fails prematurely, are all consequences of a failure to maintain. In Alaska, we do not get the breakdown of the solids that can and often do create problems because tanks are buried so deep and are colder on average than systems in the Lower 48. There are many simple things the septic owner can do to help a system perform well. One of them is regular septic tank pumping on a regular basis. In Alaska, this is often either on a yearly or bi-yearly basis, depending on several factors such as age of the system, number of residents in the household and size of tank. Please see our FAQs for more helpful tips on taking care of your septic system. We can send you periodic reminders or even call or e-mail when your next service is due. Many of our customers are on an auto-service reminder. 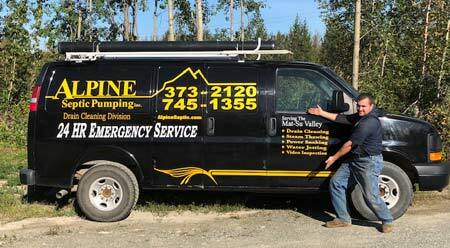 Alpine Septic maintains a fleet of pump trucks to handle everything from the home owner septic tank to large commercial jobs. Contact us to schedule service or 7 days a week in an emergency. Remember, regular maintenance helps prevent those costly evening and weekend call outs as well as the potential damage a backup can do.